Activity Workshop is for different groups, ages 6 months to 4 years. There are morning and afernoon classes during the week also Saturday morning clases as well. For infants, toddlers and preschoolers, play is serious business. Through environments and experiences filled with fun, freedom and fascination, they learn about themselves, other people and the greater world around them. As they do so, they develop the basic skills and concepts that will enable them to easily and effectively conquer all the complex intellectual and interpersonal challenges they will face in the years ahead. Research indicates that young children who are allowed to 'learn how to learn' through relaxed and enjoyable play activities eventually become much better students than those who are subjected exclusively to rigid programmes of instruction emphasizing specific acedemic content. Studies also show that the play of young children is enhanced immesurably by the knowledgeable guidance and enthusiastic participation of their parents. With help from top experts in early childhood education, we have a continuous series of developmentaly-appropriate play programmes that offer young children the most powerful preparation for the future and the best chance to maximise their potential. 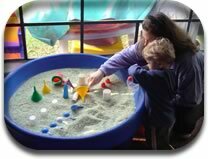 The carefully crafted equipment and highly engaging activities are designed to stimulate and and solidify optimal progress at each stage in all significant areas, including sensory and physical skills, intelligence, language, social competence and self-esteem. © 2010 This material is Copyrighted and may not be used without the direct permission of the Author.